The salient feature of the thermal structure of the ocean is the thermocline, which is particularly sharp and shallow in low latitudes. The processes that maintain the thermocline are presently of considerable interest because those processes appear to be of central importance to interdecadal climate variability and global climate changes (Cane et al., 1997; Gu and Philander, 1997; Liu, 1998; Zhang et al., 1998a). The first studies of the thermocline were motivated by Ellis' (1751) measurements that revealed extremely cold water at depth in the tropical Atlantic. Rumford (1800) speculated that cold currents from polar regions must sustain the low temperatures in low latitudes. Lenz (1845), who first noticed that the depth of the thermocline decreases with decreasing latitude in the tropics (see Fig. 4.4.1a), inferred that there is equatorial upwelling sustained by a pair of thermohaline cells, one in each hemisphere (see Warren, 1981b, for a historical review of this topic). A century later, these ideas are quantified (Robinson and Stommel, 1959; Robinson and Welander, 1963) in a model in which the thermocline depends on a balance between the downward diffusion of heat and the upwelling of cold water. Pedlosky, 1987a; Liu, 1994; McCreary and Lu, 1994). In these models, subduction of surface waters in the subtropics, which in part is maintained by poleward Ekman drift in the surface layers, feeds subsurface, equatorward geostrophic flow along isopycnals. Upwelling, especially at the equator, closes the circulation. Evidence for such a circulation comes from hydrographic sections and tracer data (Tsuchiya, 1968; Wyrtki, 1975; Fine et al., 1981, 1987; Quay et al., 1983; Roemmich, 1987; Tsuchiya et al., 1989; Johnson and McPhaden, 1999). If it is assumed that water parcels conserve their potential vorticity fdzp as they travel equator-ward, then major features of the thermocline can readily be explained. Because the Coriolis parameter f decreases with decreasing latitude, conservation of potential vorticity requires that the vertical density gradient dzp increase. The reduction of layer thickness for all the subduction layers further requires a shoaling of thermocline as the equator is approached. 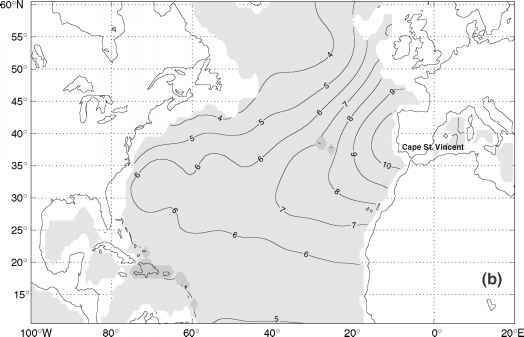 This tropical-extratropical oceanic exchange is a means by which a change in surface conditions in the extratropics can affect the structure of the tropical thermocline, in turn affecting tropical ocean-atmosphere interactions, and hence can contribute to climate fluctuations and climate changes at decadal and longer time scales.